This recipe is very dear to my heart. When I had my first child, I was on a dairy-free diet and consumed a lot of these tacos... I’m talkin' living in a taco truck amount. and actually I still can’t get enough of these! I seriously make them at least once a week. Whether you are into healthy eating or not, these veggie tacos are really yummy and satisfying. The keys to these tacos are caramelized roasted hearty veggies, guacamole, salsa and DIY refried beans. 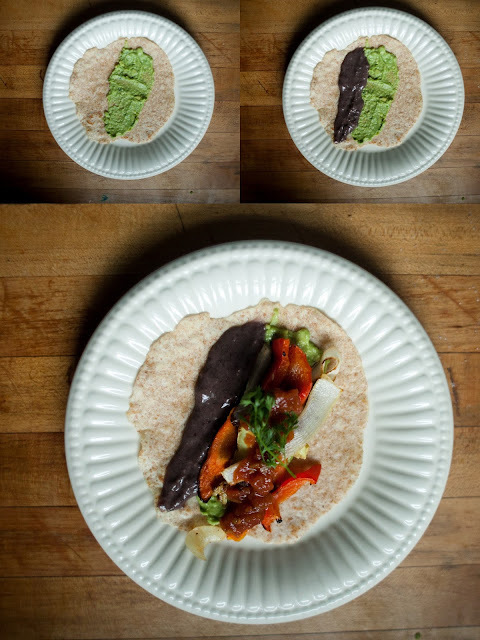 To make these tacos even more special, try make them with homemade whole-wheat tortillas. When you take a bite of one, you get the slight smokiness with sweetness from the roasted veggies. Then the creaminess from the guacamole and refried beans really compliments the salsa and veggies. lots of flavors, fiber and protein! 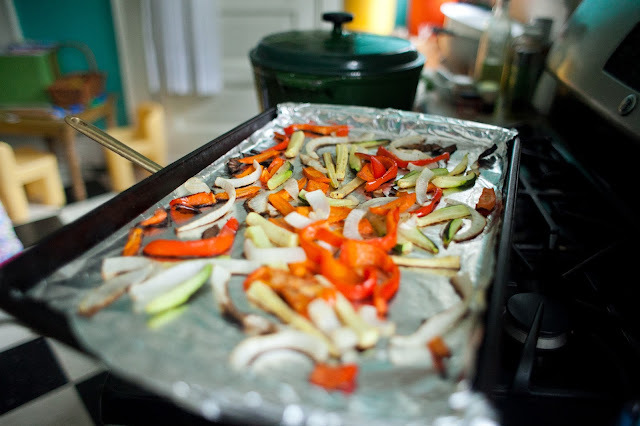 ok so first, let’s talk about how to make perfect roasted veggies. 1. Preheat oven to 400 F. Set the oven rack on the lowest position. Toss all veggies and seasonings together, mix well. Place them as single layer on a large baking sheet lined with foil. Roast for at least 30 minutes. You should check the veggies after 30 minutes. If you think they are nicely browned, take them out. If not, go for another 5 minutes. 2. Do Not Crowd the veggies. 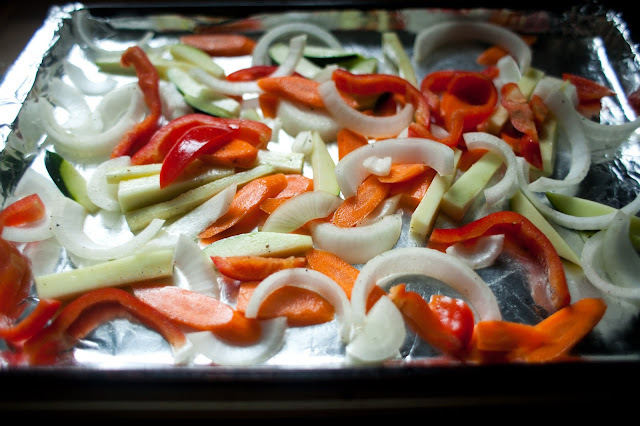 If you pile them together, you will end up steaming the veggies and hinder the browning of the veggies. if there's no browning, there's no caramelization. If you don’t have a large baking sheet, you should use two small ones. don't compromise! Start these veggies first and while they roast, work on the other things that go into the tacos... like whole-wheat tortillas, guacamole, refried beans, and salsa. Everyone has a favorite recipe for guacamole or salsa. of course, I will share my guacamole recipe here as well. 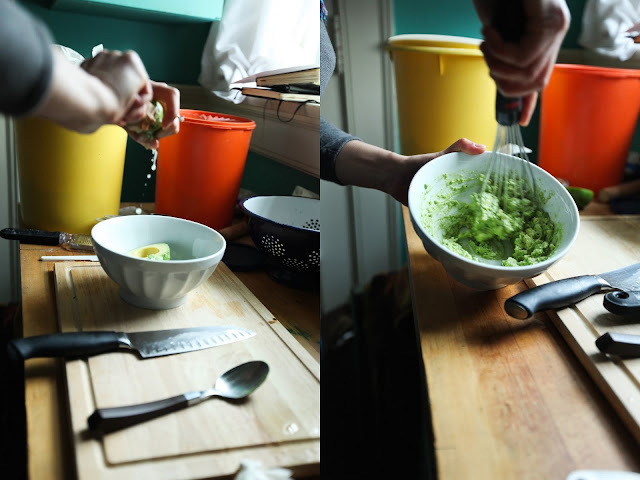 In a medium bowl, gently toss together the scooped avocado, lime juice and lime zest. Add the remaining ingredients. Mash well, and give it a good whip with a whisk. Add any optional “fixins”, if desired. Serve at room temperature. A good Guac has a lot to do with the ripeness of the avocado. 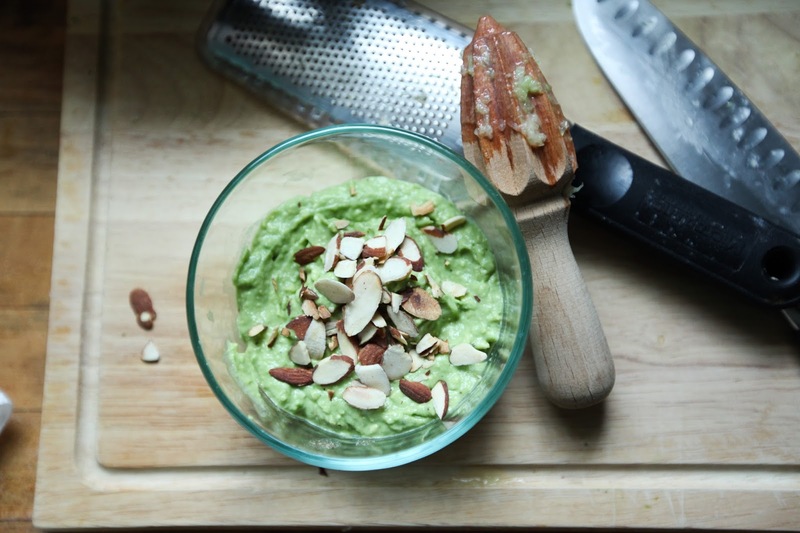 The riper the avocado is, the creamier and tastier the Guac is. All the central oil is in the peel of the lime. The zest makes the lime flavor in the guac stronger. Why not use it?! 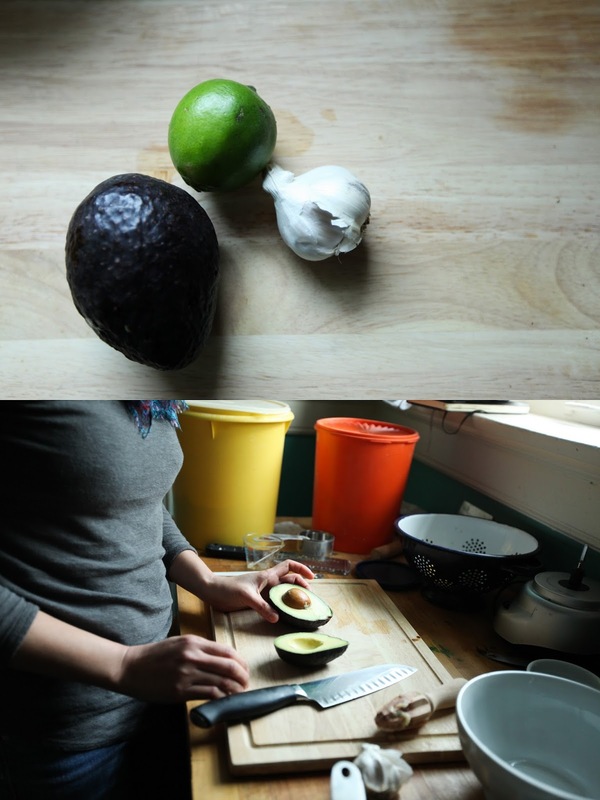 Tossing the avocado with lime juice and zest first prevents the avocado from turning brown, or oxidized. on to the refried beans! Super simple and super healthy. No lard involved. Period. Place the black beans, salsa, and olive oil in a food processor and blend till smooth. 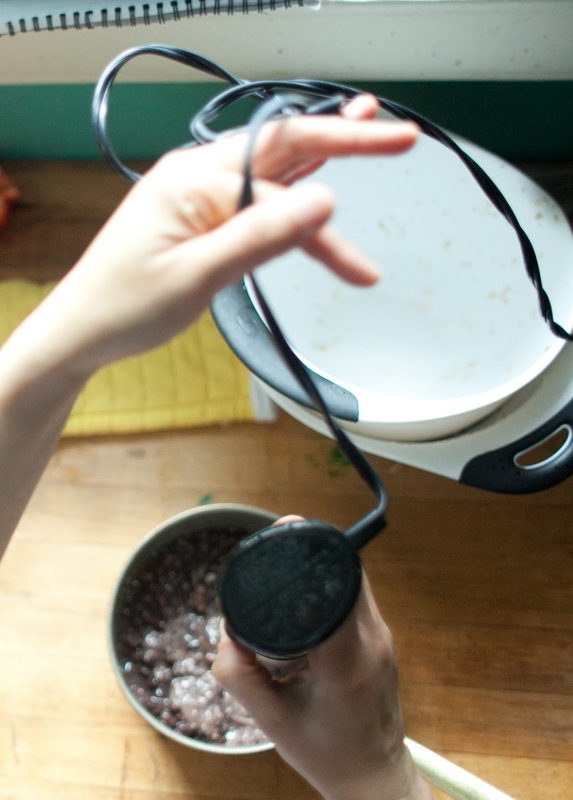 Heat the pureed beans in a small saucepan over medium heat until it is warmed through. If the mixture appears too dry, you could add some of the reserved liquid. You should start with 1 tablespoon. Don’t get over-aggressive. Or else you would end up runny refried beans. Note: An immersion blender would be a very helpful tool here. You can just puree everything in the saucepan. On a piece of warm 6-inch tortilla, I spread 1 tablespoon guacamole, 1 tablespoon refried beans, then top with some of the roasted veggies, top with salsa. Fold it and devour. YUm! tacos are the best food ever and amen! This looks so yummy! I bet it would be great with grilled veggies, too, so you don't have to heat up the kitchen in the summer. You are so smart! Grilled veggies will be a great alternative to this recipe! Very rarely do I feel compelled to comment on blogs, but I made this tonight and oh.my.goodness. They were THE BOMB! (Do people still say that?) Seriously, I could not believe such goodness came from my kitchen! I had come across the tortilla recipe a few weeks ago and seriously make some once a week. I will never ever go back to store bought. And my last comment was from my husband's account. I sincerely apologize. Mostly to him because he would never say "the bomb."